I promise, this is the last week I will talk about eyeglasses. This has just been such an, pardon the pun, eye-opening experience for me. The view through my daughter's glasses. Pretty blurry! My daughter has her glasses now. They're pink and cute and she is, of course, adorable in them. 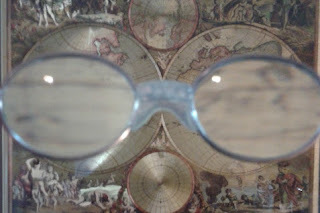 When the optician put them on for the first time, my daughter looked around for five minutes, not saying a word, a grin spreading slowly across her face. It has been so much fun to watch her discover things for the past few days. Someone finding Christ is much the same. They suddenly see things differently than they ever have before. There have been many changes in her in the few short days she's had her glasses. She's not running into things, she's much less frustrated with meticulous tasks, and overall she's just a happier little girl. The biggest thing that struck me though is that she is actually seeing herself for the first time. While we were at the doctor's office, I lifted her up to a mirror. I wish I had been filming it because the look on her face was priceless. I can only begin to imagine how she looked to herself before. Her curly hair is more often than not in a wild cloud around her face, which probably made her even image even fuzzier. Now, with her glasses, she can make out her ringlets and see herself as she really is. How are you looking at the world? When we look through our sin-natured eyes, we can see so many things wrong with ourselves that are really just a skewed perception. We see things the way the world sees them - blurred by the lens of flawed priorities and misconceptions. Changing our views for the glasses of Christ puts things in such a different perspective! My little girl can now see herself in the mirror and tell me how she wants her hair done. She can also see the crushed Goldfish crackers in the van and tell me what a mess it is. When we look at things through the eyes of Christ we are better able to see the wonderful being He made us to be and the mess the world around us is. In many ways it has been like watching my daughter get a new life this week. What a blessing that we can get spiritual glasses as well! What is one thing you see differently when you remember to look through the eyes of Christ instead of the eyes of the world? Just on actual physical sight . . . I remember so clearly when I got contact lenses the summer before fourth grade (yes, my eyes were bad enough to need contacts that early). I remember walking out of the eye doctor's office and seeing LEAVES ON THE TREES. I mean . . . I just hadn't seen them before. They were glorious and individual and shook and shimmered in the sunlight and wind and I just DRANK in the sight of them. I still love, love, love looking at trees, even all these years later. My husband said the same thing - although it doesn't sound like his eyes are as bad as yours. I got my first pair of glasses last year, but they are very weak and mostly for working on the computer or reading.